One consequence of the cold weather is that I don’t use my art room, I stay indoors and paint at my office desk instead. The art room has no insulation, dirt under the concrete floor etc so it is freezing out there. Working at my desk means working smaller, and not being so messy with the paint. I have started a new poppy painting tonight. It’s only 6″ square, which is a nice size to work on, and it’s much darker than the ones I have done up till now. I suspect that is a reflection of the dark skies outside my office window today. It is also, at this stage anyway, a lot more abstract – but it’s not finished yet so we’ll see what happens. The more familiar I get with a subject or theme, the more abstract the work tends to become. As my head and hand come to *really* know the theme, I feel less need to make it recognizable. I like the gap between reality and abstraction, where the suggestion of a theme sits. This is a terrible photo – flash on wet paint etc, but it gives you some vague idea of what I’m up to! Awful photo, flash at night on wet paint - sorry. 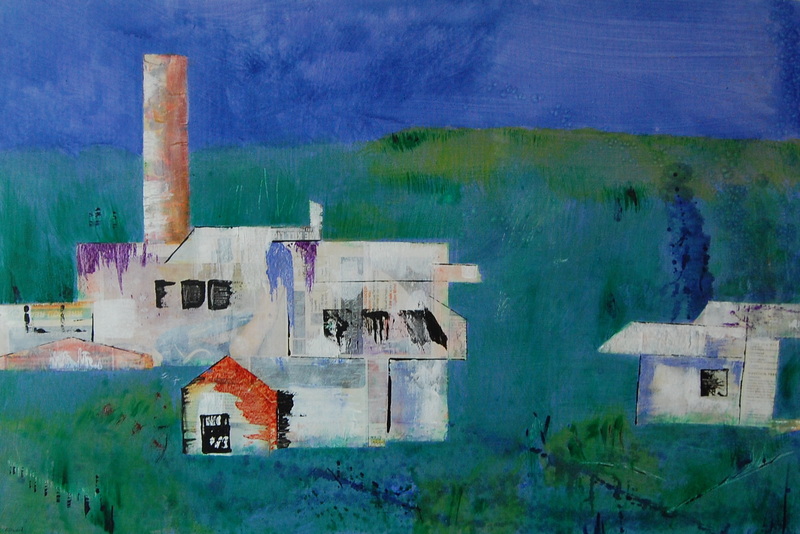 Next month Thornton Gallery in Hamilton will hold it’s annual OSFA (One Size Fits All) show. 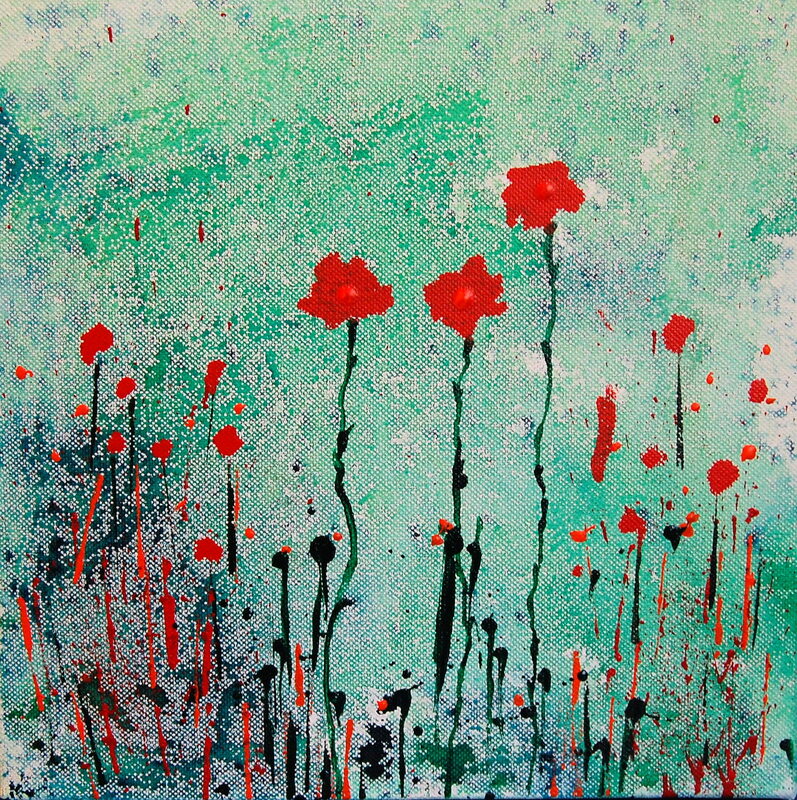 I’m entering two works, both 10×10″ which is *the* size, based on the poppies from Italy. 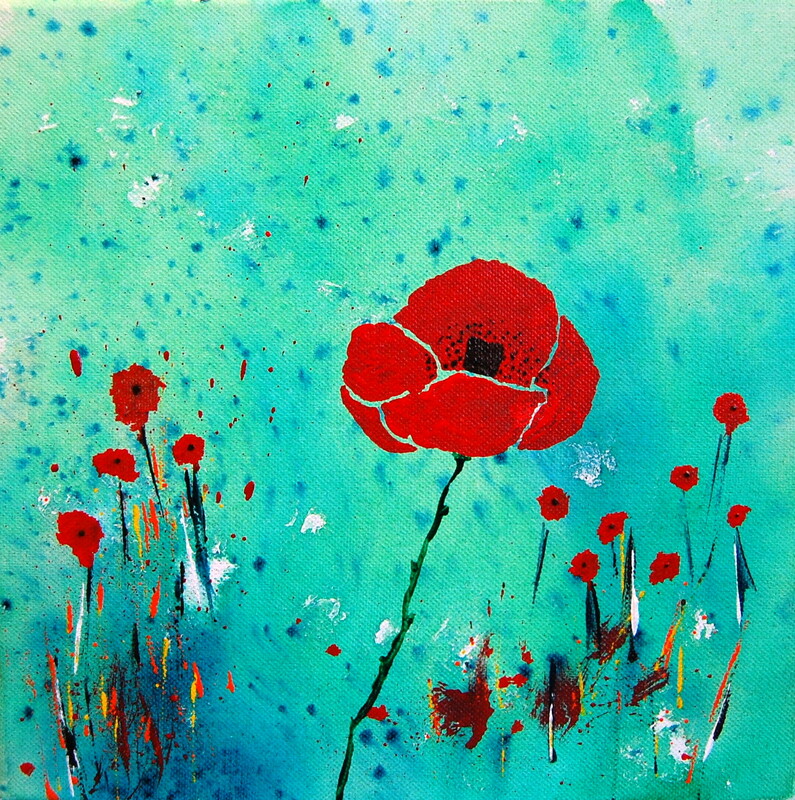 The longer I work on these the more abstract the poppies become, which is what I would expect to happen over time. As I get more and more familiar with the shapes and colours, as they sink deeper into my brain, what my hand produces is less and less photographic. It’s a process I love. 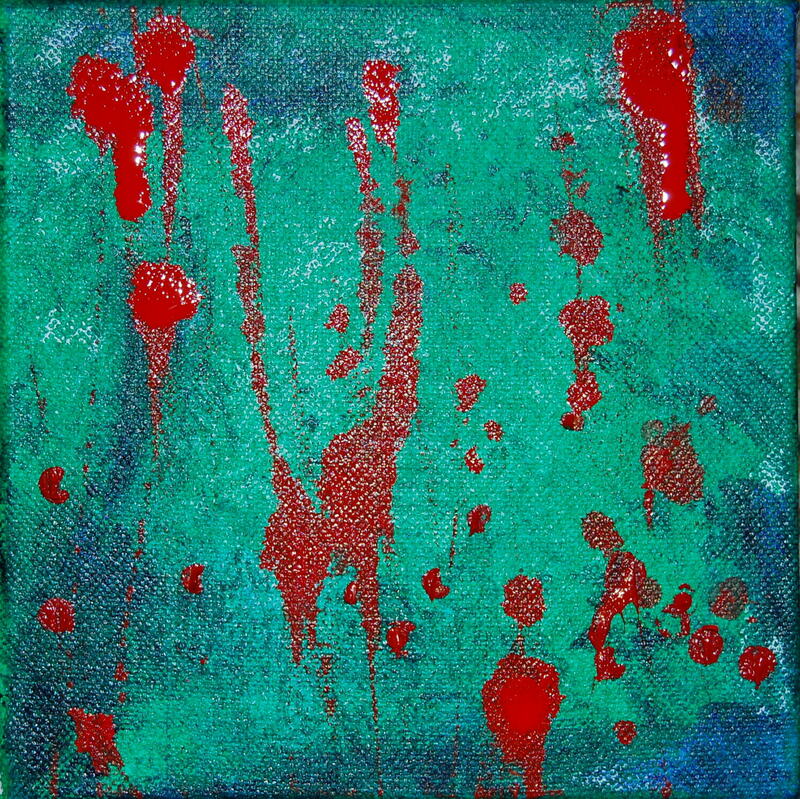 I’m really enjoying creating these, with their splashy splattery backgrounds and their streaks of red. Perfect for doing on a cold winter’s day. 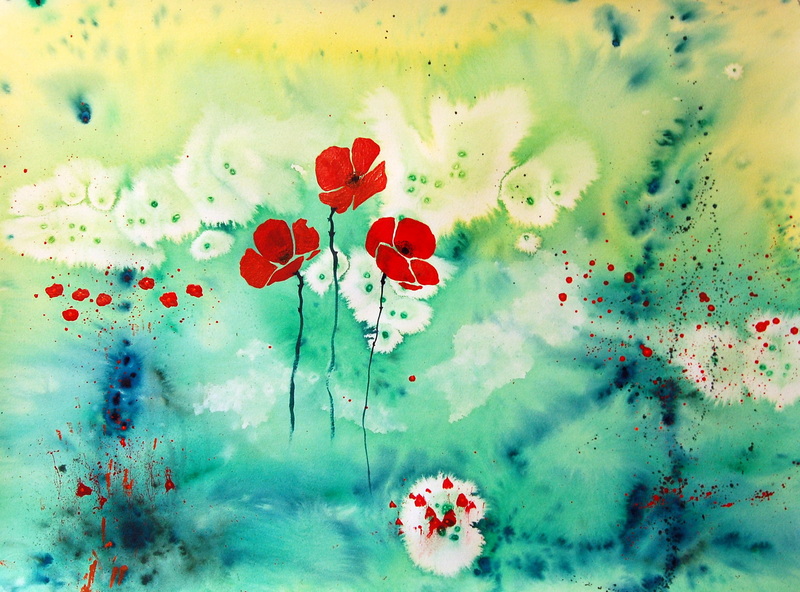 Here’s the latest, titled “Remembering poppies – Florence”. No longer on Facebook – revised! I’ve used Facebook for a long time now, but have become increasingly concerned at the constant “enhancements” that encroach on my privacy yet are poorly explained. The anxious feeling has been growing for a while now. I resent the time it takes to figure out what they have done, what it really means, and then ensure my information stays safe – despite the fact that I have always been careful bout what I put on there. I have deactivated my account and am going to go back to using my blog as my primary means of chatting with friends, as well as sharing my art. What does this mean? There will be more posts here, and a little more that’s not strictly art related. 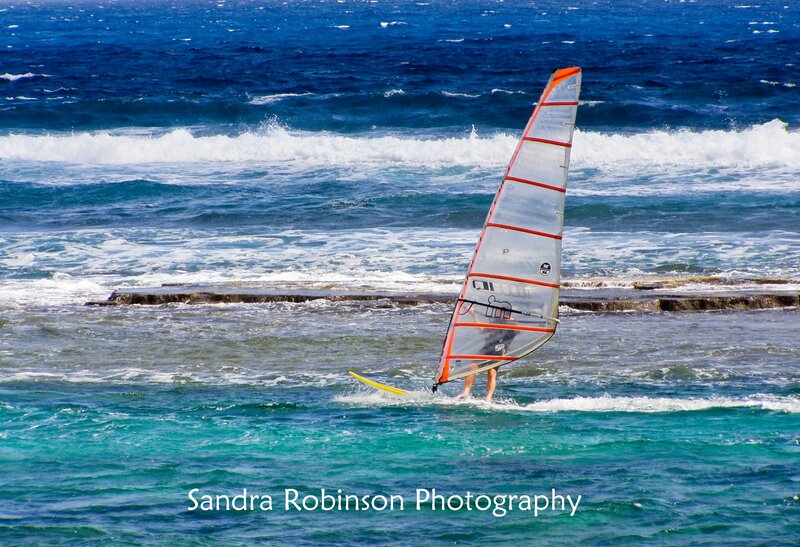 My good friend, and awesome photographer, Sandra Robinson kindly let me use one of her recent photos. Okay, so I took it from her Facebook page, but I did tell her I was going to! The thing that appealed to me the most was the horizontal bands of color running throughout the shot. 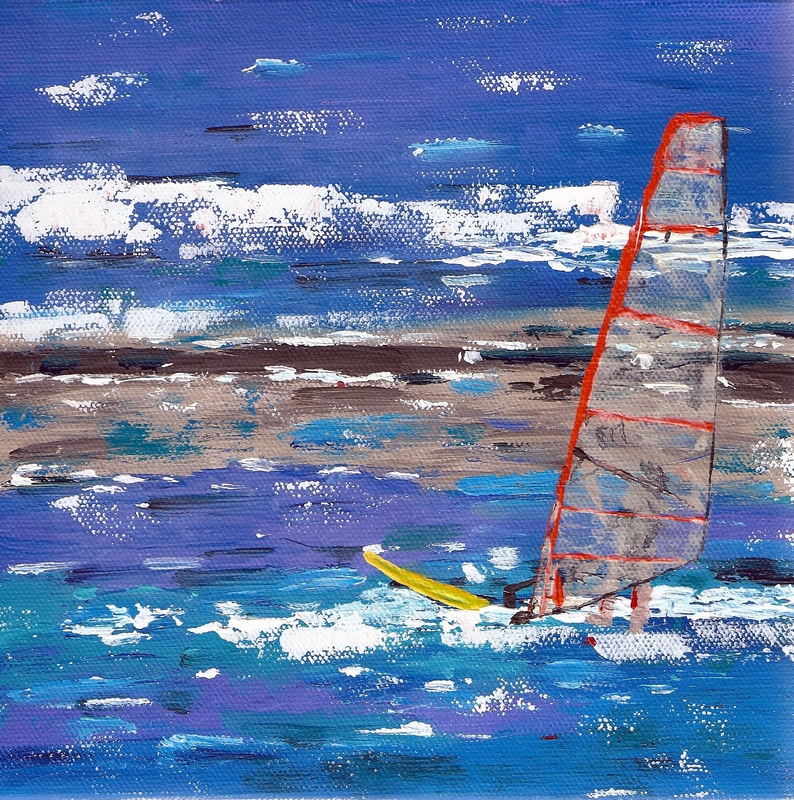 I love the sea, and have always wanted to try windsurfing. There’s an exhibition coming up in September at the Thornton Gallery in Hamilton, called “The Great Waikato Kickoff” – timed to coincide with the Rugby World Cup – works need to have a Kiwi connection for the tourist market so this seemed a good image to start with. Of course the final result is only similar to the original but Sandra’s photo made a fantastic starting point. Over at the GPP Street Team Michelle’s asking if the change of seasons brings a change of colour palette. My initial thought was no – my colours are what the are. There is something that changes with the seasons, and that’s the size I work at. But then, as I looked for examples of the size thing, I started to notice that there are changes in my colour palette – subtle, but the changes are certainly there. By the way, we’re just about at the shortest day and so far it’s been a winter with record temperatures; records highs, that is. Today is overcast and about 17 (63) degrees. A socks and t-shirt day, not a boots and cardigan day. Why does the size I at work at change with the seasons? Practicality. My art room is in the old caravan shed; it’s unlined, with a concrete floor on dirt, and uninsulated corrugated iron walls. In a world – cold! To get to it I have to dash outside in the pouring rain, only a short distance but thoroughly unpleasant on a bad day. For most of the year I work BIG in the art room, flinging paint round and being messy. Then, for the coldest wettest months of the year I work on the desk in my inside office that I use for studying and to run our small business. This means working smaller, and working neater. I try hard not to fling paint up the walls (but haven’t always succeeded). Looking at the images in my files, I can see that I use more warm and even hot colours in winter when I am working smaller. The big works are often quite cool blues and greens. It’s not something I had been conscious of before. Thanks for opening my eyes to it Michelle. Below are some poppie paintings; the full size sheets of watercolour were done in summer but the 10″ square poppies were done this morning. The large blue one was also a summer paintings but the small red painting was a winter one. The earth shook last night - 4x8"
Working the Freezing Works XI - 40x60"